Kind of strange, Hotmail, oops!, excuse me, Outlook.com, did not flag this email as spam..
You should know, by now (halfway through 2013), that scuzbucket sleazeball “hackers” send us emails trying to trick us into clicking links to dangerous websites, or download a virus, and further know that PDF format attachments can be “poisoned” to contain a virus. 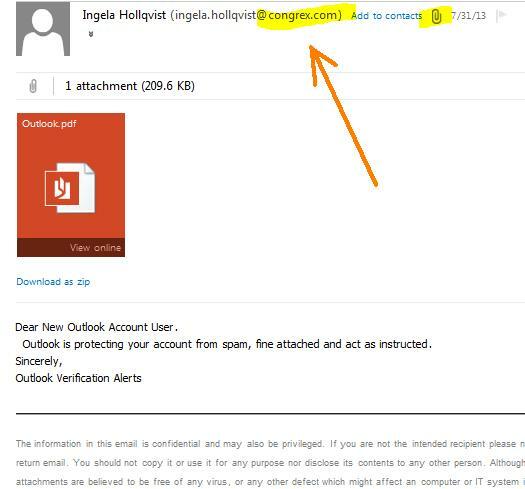 Even though this particular attack (and yes, this is an “attack” on me) purports to be from “Outlook Verification Alerts”, the Sender field is someone’s name (in my case, “Ingila Hollqvist”, though that is probably randomly generated). And their email address is (showing as) something other than “outlook.com” or “microsoft.com”. And of course, there’s the Engrish. Now I know that you would never open such an email attachment as this one here. But I guaranty some folks will.